Is Qualcomm a Buffett Stock? We can't know for sure whether Buffett is about to buy Qualcomm (Nasdaq: QCOM) -- he hasn't specifically mentioned anything about it to me -- but we can discover whether it's the sort of stock that might interest him. Answering that question could also reveal whether it's a stock that should interest us. Does Qualcomm meet Buffett's standards? 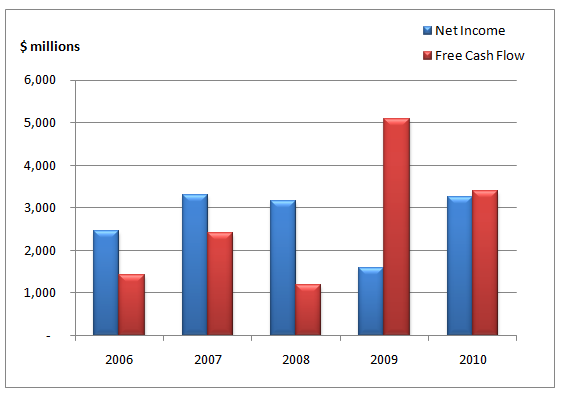 Let's examine Qualcomm's earnings and free cash flow history. Aside from 2009, Qualcomm's earnings power has been fairly consistent. Since competitive strength is a comparison among peers, and various industries have different levels of profitability and require different levels of debt, it helps to use an industry context. CEO Paul Jacobs has been at the job since 2005. Telecommunications devices are fairly susceptible to technological change -- Buffett might be a bit wary of investing in the industry. Regardless of whether Buffett would ever buy Qualcomm, we've learned that, aside from the techiness of its industry, the company exhibits several characteristics of a quintessential Buffett investment: consistent earnings power, fairly high returns on equity with limited debt, and tenured management. To stay up to speed on the top news and analysis on Qualcomm or any other stock, simply add it to your stock watchlist. If you don't have one yet, you can create a watchlist of your favorite stocks.